It’s time to start painting the mountain house. I’m going over our painting plans today. If you keep up with the news, then you know that we have a Cat 3 hurricane headed our way to Houston today. It’s probably not going to be a direct hit like Ike and Alicia, but they are expecting it to sit on top of us for several days and possibly produce a lot of rain and flooding. We are good on batteries, flashlights, water, food and gas. So now, it’s just a matter of praying and sitting it out at this point. So with all that going on, I thought today would be a great day to show you what’s going on at the mountain house in North Carolina. Since we rent it out for vacation rentals, it’s always tricky having any work done. We have to find a slot where we don’t have renters in the house to do any work. The painting is scheduled for September; we’re so thrilled! The current color of the house almost kept us from buying it. 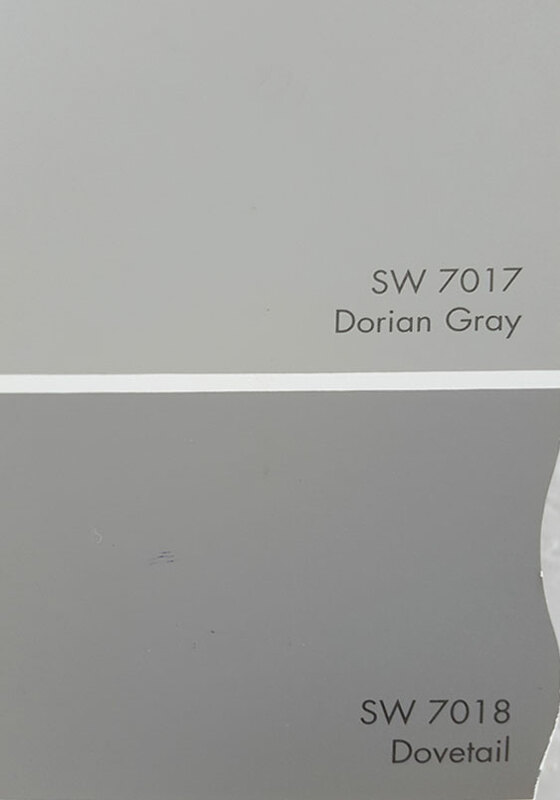 We are looking to use Sherwin Williams Dorian Gray on the siding and Dovetail on the trim. Here’s a rending of what it might look like. I also changed the color of the roof, since we’ll change it when the house needs a new roof. As much as I don’t like the current roof color, we’ll just keep it until the roof needs to be replaced. It’s such a big expense. Our long-term plan is to change out the garage doors for wood, and add a trellis over the garage doors. I saw this lovely house nearby this summer. Although this house has more of a brown color, I was inspired by the dark trim. Also note the nice gray roof color. That would be great on our house. 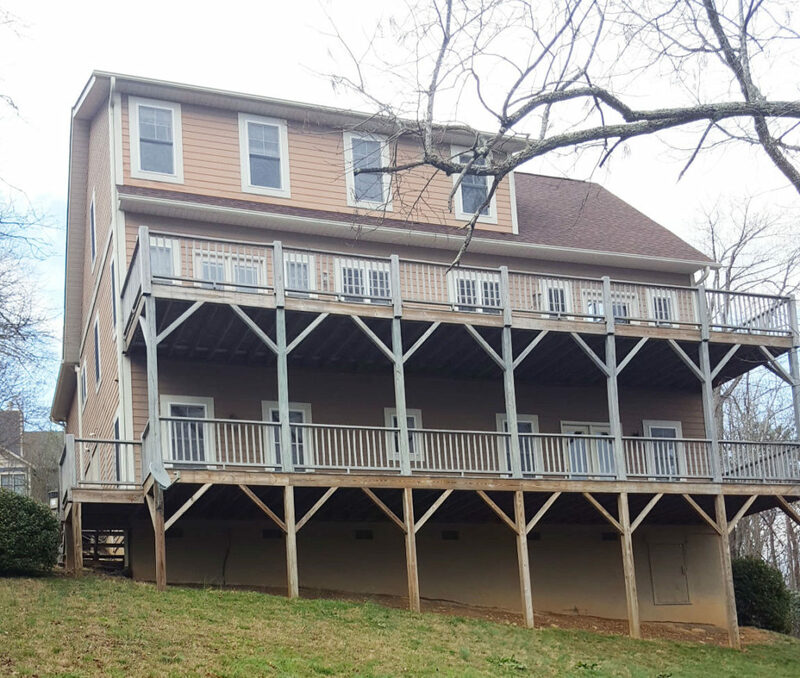 There may not be much siding on the front of our house, but there’s lots on the back and the new color will have a big impact. We’ve got a lot of work to do to the exterior and the interior, and it will be happening slowing over time. 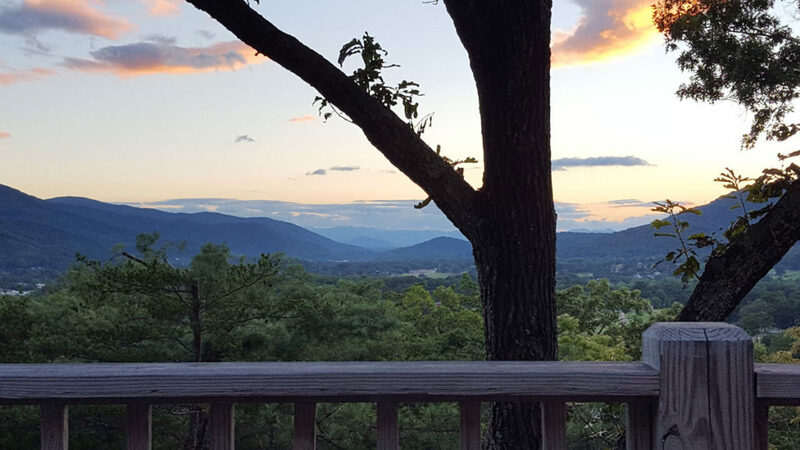 It would be easier to buy a house that was closer to my taste, but we love the views here. When people asked why we picked this house, my answer is this view from the deck. I’ll have pictures of the new paint job for you in October. 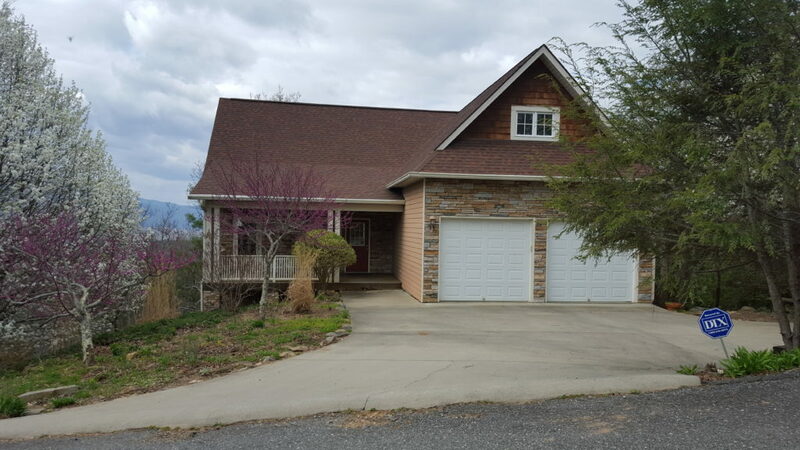 Want to see more of the mountain house? CLICK HERE. Love your choice of colors! Can’t wait to see the results in October. My thoughts are with you, your family, and your community as you brace for Hurricane Harvey. Having lived on the Alabama coast my entire life I’ve witnessed the devastation these storms can leave. Praying for your safety, for those along the Texas coast, and others who will be affected by this storm. Let us know how you are doing! Thanks Beth. We’ve been through this more times than I care to remember. We appreciate all prayers for us and our community. Love the changes you’re making in your mountain house! And the exterior colors are great? 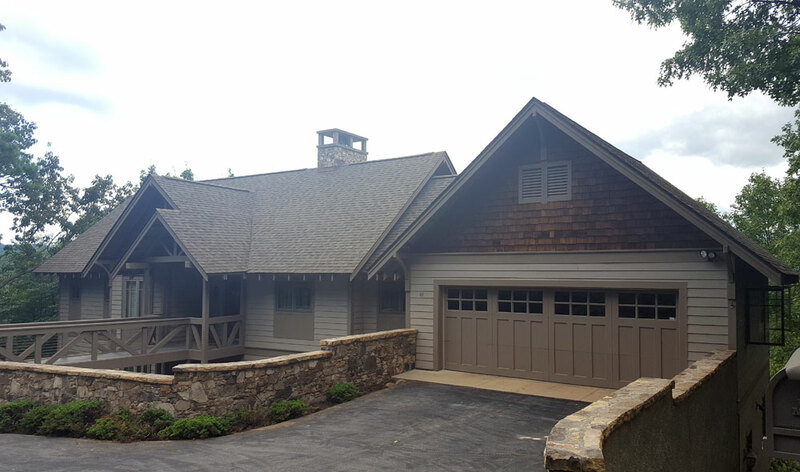 It will make such a difference to lighten up the outside of your mountain house – and with a light gray roof and wood stained garage doors, that will complete the look. I can understand why you chose this house. The view is wonderful in photos – I can only imagine what it’s like in person. Hopefully the weather will make a turn for the better and you will not suffer any damage. I think gray will be the turquoise and brown of it’s time just like 10 years ago. I think it you went with a nice green shade(or pulled another color out of the brick front) and perhaps some complimentary shutters on the front you would be better. I think in less than 10 years you’ll have to repaint because gray is just to trendy in my view and is on the way out. I would respectfully disagree that using gray for the exterior is a mistake due to it being ‘trendy’ and ‘on the way out’. Gray, Grey, or Griege (or whatever they’re calling it these days) has been on the painters (and others) color wheel pallet for centuries. It is particularly noteworthy in the New England part of the country, which is where I started my life’s journey 70 years ago. Residing now in Florida, hubby and I are in the process of a whole house remodel. I’m finding that I need to pay homage to some of my Timeless NE roots, with the goal of not sticking out as being ‘different’ or sorely out of place. 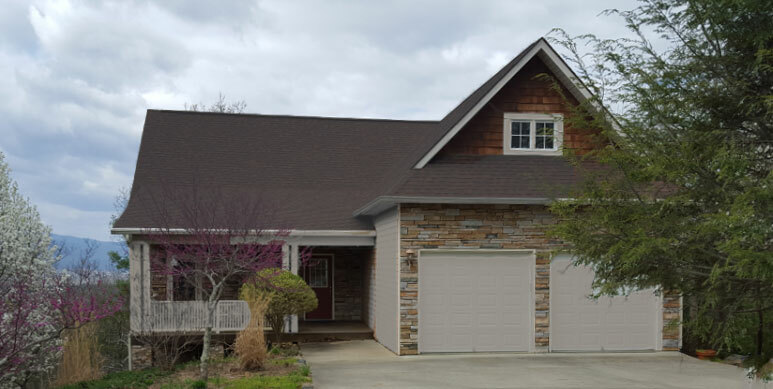 We’ve sided the faux ?brick with a Gray ‘cedar like’ shake single composite, landscape tbd white picket fence, blue hydrangeas, climbing roses. We’ve met the overwhelming approval from the ‘natives’, so much so, that our neighbor is now going ‘Gray, Grey or Greige’.? Prayers for you and family. My brother and family live there as well. It is definitely all about the view!!!! And your view is breathtaking!!! Thinking of you as Hurricane Harvey approaches. Stay safe and dry!! Love your colors. My prayers go to all of you in the storm path. We are on the gulf coast of Florida and know what you are going through. Wishing dry feet. Love how the painted garage looks so much better, thanks for the idea, I heard on the podcast. I hope you are ok, we are in Fort Worth. I thought you had evacuated Houston and was at the mountain home painting! Haha, silly me! I’m sure it will be even more beautiful when all your touches are finished. Looks good now. Love the changes you have made. I like the choice of color. Nice post.